Light, dark, medium, city, city plus, French, Vienna, Italian, American, espresso! What are we talking about? These are commonly used words to describe coffee roast levels. There is very little industry standardization for roasting which can cause confusion. In general, roasts fall into four color categories. We will explain and clarify what the common roasting levels are and their characteristics. After a few minutes you will hear the first ‘crack’. The bean will have visibly expanded in size and will be light brown in color. There will be no visible oil on the surface because the beans are not roasted long enough for the oils to break through to the surface. These roasts are generally preferred for milder coffee varieties. Often this roast will exhibit more of its ‘origin flavor’. Beans from regions such as Java, Kenya, Ethiopia, Hawaii, and Jamaica are commonly roasted to this level so that their signature characteristics come through in the flavor. This roast tends to be higher in acidity and lighter in body. Shortly after the first ‘crack’ but before the ‘second crack’ occurs the beans are considered to be at a medium roast. Beans will be medium brown in color and still exhibit a non-oily surface. This roast is generally preferred in the United States. There will be sweeter tones than the light roast and the body will announce more balance in acidy, aroma, and flavor. This is a great starting point for coffees you’re roasting for the first time. Generally, most coffees taste good at this roast point and it will be easy to gauge whether a lighter or darker roast is needed to suit the bean or your own taste preferences. You will hear the bean begin its ‘second crack’ and you will see oils rise to the surface. The bean will become a rich, dark color and the surface of the bean will appear slightly shiny. Taste at this point will be spicy, chocolate, dark berries and less acidity. You will have a fuller bodied cup and aromas and flavors are more evident. Finishes tend to be drier, more like baker’s chocolate or dry wine. Central American, South American, and Indonesian coffees generally taste very good at this roast point. Beans will be shiny and have an oily surface. The beans will begin to smoke and the sugars begin to carbonize. Tastes will be smoky/sweet with lighter body. The darker the roast the less acidity will be found in the cup. Here is a good place to note that there is no such thing as an “espresso roast.” Espresso is a beverage, not a roasting point. Beans intended for espresso are generally roasted Medium-dark to dark. We’ve found that Brazilian and Indonesian beans stand up well to a Dark Roast. We offer the best quality and price on raw coffee beans for home coffee roasting. 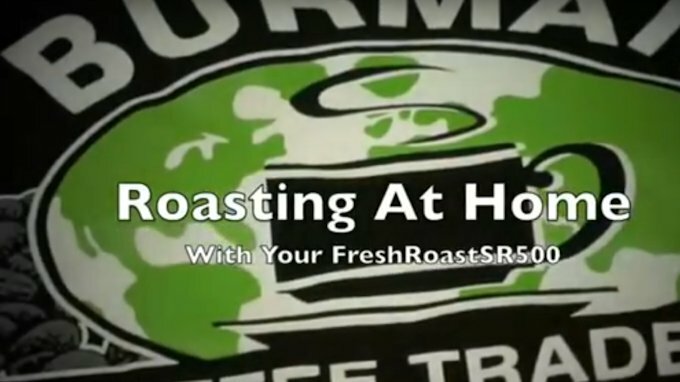 Fresh Roast SR500 Coffee Roaster – our best selling home coffee roasting machine.